Leanne Ross and Gemma Fay are heading for Holland. Picture Michael Gillen. Local footballer Leanne Ross has been named in the Scotland squad for the summer’s European Championships. Kicking off in Holland in just less than a month’s time, the midfielder, from Stenhousemuir, is part of Anna Signeul’s final football squad. 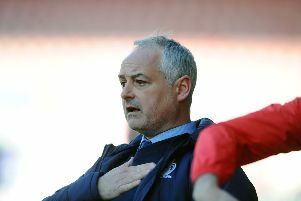 Ross recently featured at The Falkirk Stadium against Romania. Picture Michael Gillen. The women’s national team coach will leave her position at the end of the tournament, but stalwart Ross is among the Scotland delegation heading for games with England, Portugal and Spain. Leanne was also named The Falkirk Herald’s Sports Star of the Year 2016 by Falkirk Herald readers for her exploits with ten-in-a-row champions Glasgow City and leading Scotland to the finals. Defenders – Vaila Barsley, Frankie Brown, Rachel Corsie, Ifeoma Diecke, Sophie Howard, Rachel McLaughlan, Joelle Murray, Kirsty Smith. Midfielders – Leanne Crichton, Hayley Lauder, Lisa Evans, Jo Love, Erin Cuthbert, Leanne Ross, Caroline Weir. Forwards – Lana Clelland, Jane Ross, Christie Murray, Fiona Brown.